Located near Bayeux (2 km), ideal for exploring the historic center, enjoying the sea and the landing beaches, this cottage classified 4 ears Gites de France, spacious, bright with beautiful openings on the terraces and garden closed to enjoy the sun. Bel'Air The cottage will be the perfect holiday home for your stay with family or friends. I'm already missing my "Normandy Cottage" home.! everything was going to be ok. I had planned this family trip : grandparents, daughter, son in law and 2 grandchildren over the last year and walking into the home I knew immediately that we had found a gem. 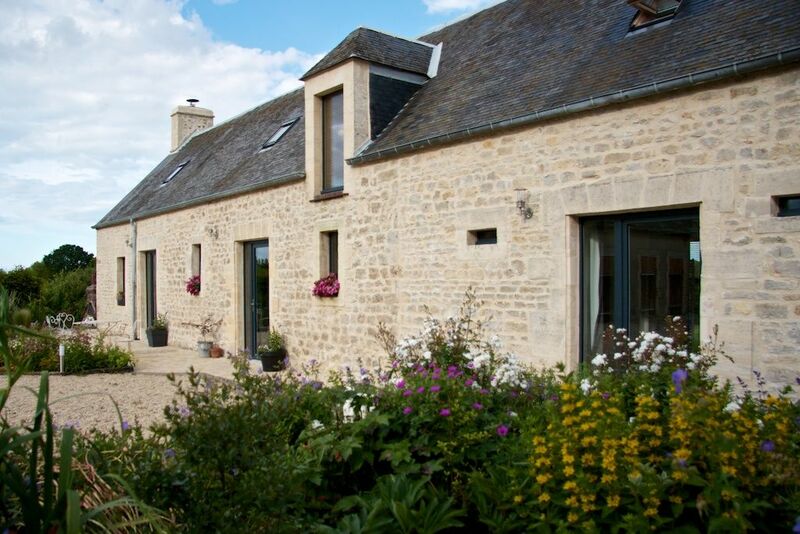 The home is located in a quiet, rural setting an approximate mile from Bayeux. It is nicely landscaped - with a large enclosed backyard. There is a backyard barbecue with patio table chairs. We were able to entertain our extended family - visiting from London for the evening - it was a perfect outdoor setting. When walking into the house there is a complete and open kitchen and dinning area - and just beyond a living room with plenty of seating - sofa chairs etc. The sofa can be used for extra sleeping space if needed. There is 1 large bedroom on the main level with large bathroom - walk in shower & separate room with Toilet. There is lots of Light in all rooms - provided by large sliding glass doors. These doors can be tipped open at the top for extra ventilation. All the floors are tiled on the main floors. There is a laundry room with all the cleaning supplies you might need. Up stairs there is a large room with 4 single beds - next to it a central sitting area - and then on the opposite end a nice double bedroom. There is a bathroom with bathtub - which worked well for the grandchildren. Also outside there is a covered area that has a ping pong table - that we used several times. The owner Betty was very nice, spoke fair English - and we communicated just fine. She is a lovely person - and knew if we needed to contact her we could - but otherwise we had complete privacy. In summary : We can highly recommend a stay here for families. It's was large enough that 2 families could have their privacy. I could also recommend a stay for a couple - the cost is very reasonable. I am home now and am missing my "home" in Normandy. Hope to return ! We were amazed how spacious the gite was and how many can sleep up stairs. The grounds are beautiful with a big garden and horses in the field over. There are chickens that belong to the owners in which you can feed and a tennis/football table and parking right outside. We found the beds comfortable and accommodating for the little ones. Best one we've ever stayed in!! The gite is quite large (2 floors) with plenty of room for a family (or two small families) - but it was just the two of us. We were warmly greeted by the owners, who live on site across the courtyard. They were very helpful and friendly but not at all intrusive. We were delighted that they had decorated "our" place with a lovely Christmas tree - twinkling lights and all. There are windows or doors in every room (including the bath). The kitchen was outfitted with everything we needed for ourselves and for a dinner party. The bedroom has a comfortable queen bed with a very warm down comforter. There is a large wardrobe but could benefit by adding a chest of drawers. The living area has a sofa and several chairs - the TV received several channels but none in English. However, there is a feature on the TV that allows viewers to select the "original language" for programs - so we were able to get some in English. There is a large ensuite bathroom with shower (great water pressure), sink and heated towel rack - it's very modern and nicely finished. There is a separate room with toilet and sink - very nice for guests. There is an entire upstairs with additional living area, bedrooms and bath. One extremely NICE feature is the under-floor heating throughout the ground floor. Really appreciated in winter! There is a good-sized private yard with BBQ. The wifi was fast and easy to use. The owners speak some English. Be prepared to pay in cash the charge for electricity and the local taxes for your stay - perhaps email the owners and ask them to estimate the charges before you arrive so you can have the cash. We've visited this area many times but this is the first time we stayed in this gite - and it was a real pleasure! Excellent property, nothing negative I could find. We enjoyed a week in this lovely gite. The house is well presented,fully equipped and clean. There is plenty of space for 2 familys. It's situated close to the town in a quiet rural location. There is plenty to do in the area. Our boys enjoyed playing table tennis and table football. Beatrix was very welcoming and helpful. She had a bottle of cider, apple juice and jelly waiting for us! I recommend this place to anyone, it was most enjoyable and relaxing. Mooie gite, van alle gemakken voorzien. Alleen wifi is matig. Aan te bevelen. Located just outside Bayeux, ideal for exploring the historic center (the tapestry and the cathedral), enjoy the sea and the landing beaches.